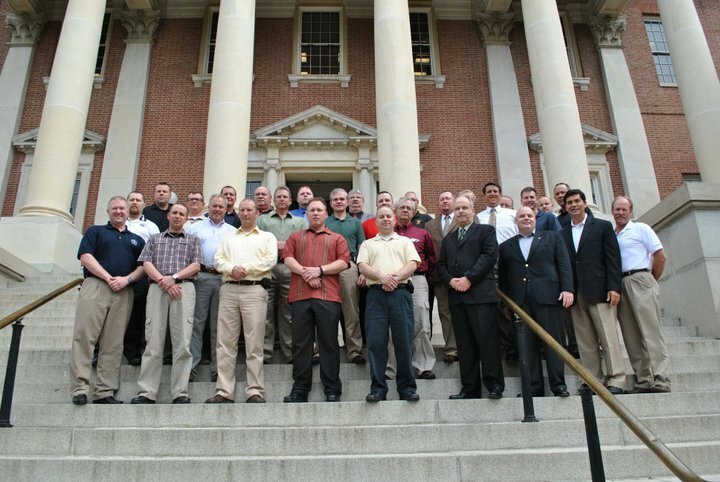 Photo: Participants in the Spring 2011 Rural Law Enforcement Technology Institute gathered on the steps of the Maryland State House in Annapolis, MD for the official group photo. Monroe Police Lt Curlis is in the front row in the yellow shirt. Monroe Police have a line on new ideas for the department thanks to Lt. Curlis. New ideas that might help the department during these difficult budget times. One way a local police department can save money is by finding a forum to discuss problems and solutions with their peers. The Rural Law Enforcement Technology Institute is just one forum that lets smaller police departments, like the one in Monroe to meet others around the country. On May 1-5, 2001, Monroe Lieutenant Brian Curlis attended the Rural Law Enforcement Technology Institute. This is the 11th year for the institute which is designed for the command staff and supervisory personnel of rural and small law enforcement agencies (Less than 50 Officers) in the United States. Lieutenant Brian Curlis of the Monroe Police Department, Monroe, Ohio participated with the officers in the photo. Participants were selected on a competitive basis from across the entire United States. "Some topics of discussion were computer aided dispatch, crime mapping, aviation technologies, communications, low cost firearms simulation technologies, records management, digital video technologies, patrol vehicle technologies, 911 dispatch operation technologies, and various others." I asked Lt. Curlis if there were any stories he could share regarding his stay at the institute. He said, "I did a presentation on the department new bar coding system for the property room to the group and made some great contacts from around the county. Each person did presentations on topics that they and their departments have overcome from building a new station to radio systems and record management systems. The program is put on by National Institute of Justice and they gave us some great information on grants, equipment and training they can provide to smaller agencies (under 50 officers)." Noting that new information on grants was being provided I asked Lt. Curlis about Monroe grants, here is what he had to say, "Lt. Robinson is working on a grant for new computers for the police cruisers. We apply for grants from the feds (Justice Dept.) and the state. Most of the grants we work on are matching fund grants, so the city will need to put up some funds. Chief [Howard], Frank [Robinson] and I all take turns with the grants, if the equipment is not a full grant we measure the need before applying." Last fall, these products were being technology related items were demonstrated:low-cost firearms simulator, guardian, Crime Reports/Command Central, License Plate Reader, Powered Parachute, Segway Personal Transporters, and ReconRobots.